Ebola, also known as Ebola hemorrhagic fever or Ebola viral disease, is a rare and deadly illness caused by one of the strains of Ebola virus. This viral agent is regarded as a prototype pathogen of viral hemorrhagic fever, with high fatality rates in humans and primates. The natural reservoir of Ebola virus remains unknown, although bats seem to be the most likely reservoir. The U.S. Army Medical Research Institute of Infectious Diseases today announced that, for the first time, the U.S. Food and Drug Administration has provided formal regulatory agreement for use of an animal model to support development of a drug candidate, remdesivir, for treating deadly Ebola virus infections. 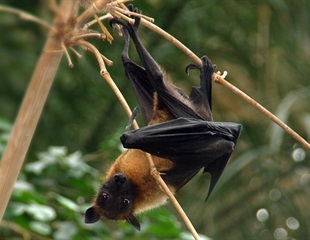 An international research team led by Duke-NUS Medical School, Singapore, has identified molecular and genetic mechanisms that allow bats to stay healthy while hosting viruses that kill other animals, according to a new study published in the journal Nature Microbiology. The Lancet has reported about the alarming status of Ebola in the Democratic Republic of Congo (DRC) on the 4th of this month following a reported 785 deaths due to the disease in the country. The government of Liberia, in partnership with the Center for Infection and Immunity (CII) at the Columbia University Mailman School of Public Health and EcoHealth Alliance, announced the discovery of Ebola virus in a bat in Liberia. Scientists from academia, industry, and government have developed a combination of monoclonal antibodies that protected animals from all three Ebola viruses known to cause human disease. Their work is described in two companion studies published online in the journal Cell Host & Microbe.